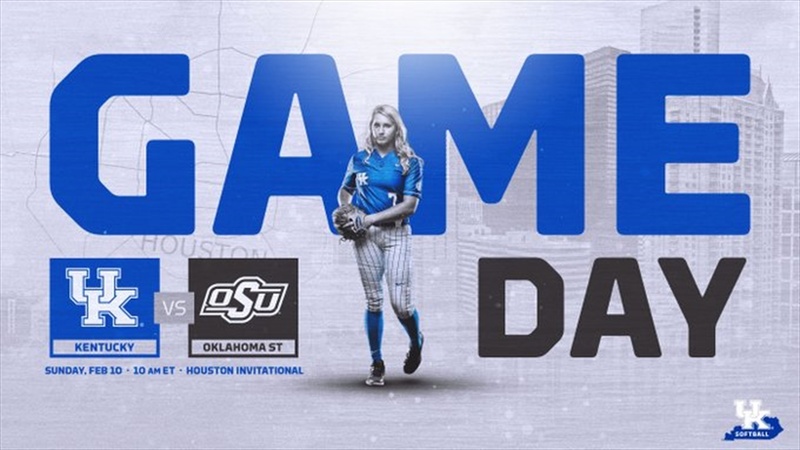 The University of Kentucky softball team finished the 2019 Houston Invitational against Oklahoma State University on Sunday morning. The Cats held the lead for the majority of the contest, but surrendered two runs in the seventh inning to fall, 8-7. Kentucky was unable to put anything across in the first as the Cats went down 1-2-3. The struggles at the plate continued for Kentucky in the second as Martens, Schaper, and Hunes all went down swinging. Katie Reed broke through for Kentucky in the third with a two-run home run, her first of the season. In the top of the fourth inning, Mallory Peyton added a big fly of her own to put the Cats up, 5-0. Oklahoma State got a run back after a lead-off double scored on a sacrifice fly, 5-1 Kentucky. The Cats loaded the bases in he fifth before Jenny Schaper flew out to the wall to end the inning. The Cowgirls responded with a run in the fifth to cut the lead to just three. Kayla Kowalik drove in Kentucky’s sixth run of the game, scoring Jaci Babbs from second with two outs. However, the Cowgirls picked up two runs on a home run, but really good plays by Cheek at third and Vick in LF end the inning with no further damage. Kentucky remained in the lead, 6-4. Kentucky took advantage of a error by Oklahoma State and took take a 7-4 lead into the bottom of the seventh. Baalman then recorded a strikeout for the first out of the inning. With one out, OSU hits a two-run home run to cut the UK lead to 7-6. After a great play by Alex Martens on a hard hit ball up the middle, Oklahoma State worked a walk followed by a walk-off home run to win the game. OSU scores four in the seventh and took home the victory, 8-7.